Indo western dresses for girls are the latest trend. 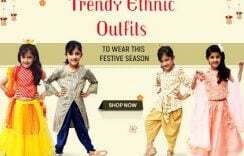 They make a beautiful fusion of the western style with girls Indian ethnic wear comprising of the contemporary style with a hint of traditional look. 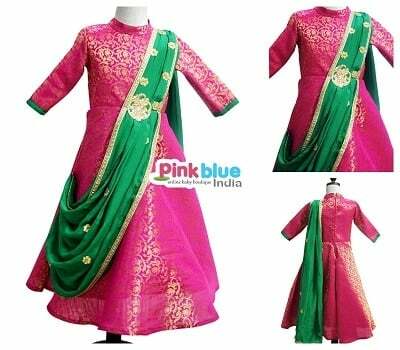 Indo Western Dresses for Girl are taking up all the wardrobes to refresh their look on special occasions thereby redefining their style for Indian weddings, functions and other events. The world of Indo western dress for girl child is offering newest patterns and styles to try on. 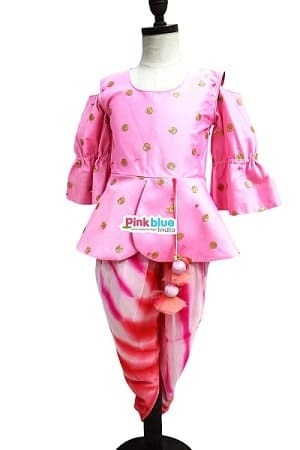 Stylish tunics, exclusive bottoms, designer gowns and suit sets are some styles featuring in unique and trendy Indo Western dresses for Girls 2018. 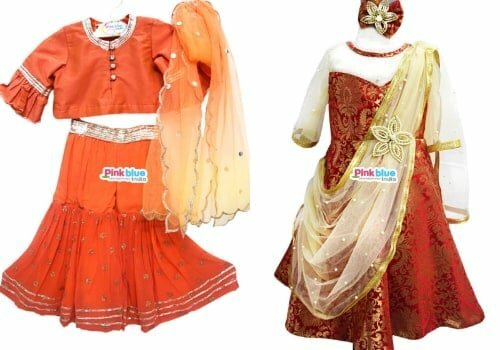 In this post, some of the WOW Baby Girl Indo Western Dresses to shop for your sweetheart for an enchanting look!!! Indo-Western styled dresses are a delight for occasions like engagement party or wedding, sangeet ceremony or Mehandi; along with festive occasions like Diwali, EID, Raksha Bandhan etc. Buy these gorgeous designer Indo western for baby girl to have her shine bright and beautiful. If it is the engagement party in your family or amongst your friend then dress her dapper in kids ethnic jackets with Dhoti Pants or Peplum Top with Black Skirt, long designer dress gown that are perfect for functions like these. In fact Toddler Girls One Shoulder crop top matched with a skirt or pants also looks very pretty as an engagement party dress. Make sure that you don’t dress her in anything too heavy because there are many other functions which will demand a heavier look!!! If it is a Mehandi function or dance party at a wedding then clothes that are easy to manage make a promising wear. keep it simple and stylish for your princess with Indo western Kurtis Kurtas that can be paired with matching bottoms. Tunics make another choice of clothing along with Cape Style Jumpsuit and Playsuit that not only give them an adorable look but also let them stay easy on clothes. Sangeet ceremonies are all about dressing lavish and lots of dancing and fun. Don’t compromise with her style on this special day and go for some classy, resplendent Girl Indo-Western Style Gown, indo western crop top lehenga for girl, Traditional Pre-stitched Dhoti Style Dress, Girl Sharara with crop top online, Baby Girl Peplum Top with Palazzo Pants etc. Remember that Sangeet functions these days are as big as wedding functions, so your little one has to stand out in these beauties. An Indian wedding is about dressing gorgeous and glamorous. So bring on Long Anarkali dress styled with Jacket, kids Crop Top Lehenga with Dupatta, Party Wear Indo Western Gown with Pre Stitched Dupatta, baby Long frocks and gowns, Bollywood dresses for kids, Dhoti style ready to wear sarees, ethnic long jackets with pants to give your little charm a sparkling look in these lovely Indo Western dresses for girls. These mind-blowing combination of ethnic and western wear will have your darling win all the limelight at the event. Gowns are the trend and Indo Western gowns for wedding receptions make a classy choice. They come in various styles like off shoulder, one shoulder, long flared etc. to get your girl a fantastic look. Ranging from exquisite Half Saree Style Gowns to innovative long designer dress gown, kids saree style gown for wedding, Indo western gowns for baby girls have the potential to spruce up your little one’s look. With the right gown, she can melt many hearts!!! 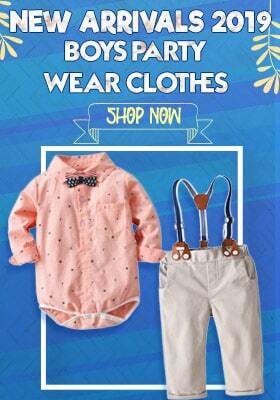 You can even style a new look for her birthday party with these awesome Indo Western clothes for girls. Pick up some great styles for a fashionable look on her special day. Choose from the enchanting One Shoulder crop top with long skirt, Kurta with Palazzo Pant, Dhoti style skirt with top etc. for a fab look. You can even shop for tunics and indo western gowns which promise a picture perfect birthday look. Indian festivals are incomplete without dressing up pretty. Whether it is Raksha Bandhan or Diwali, Eid or Bhai Dooj, you have to have pretty dresses for a lovely appeal. 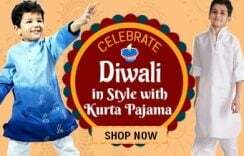 Other than Indian kids Dresses for Festival, Girls festival wear, Indo Western dresses for girls like long designer dress gown, Half Saree Style Gown, Traditional Pre-stitched Dhoti Style Dress, One Shoulder crop top with long skirt make beautiful choices to add more spark to festivities. When you are buying a special dress for a special occasion, you want it to be perfect. Right length, fitting and colour. 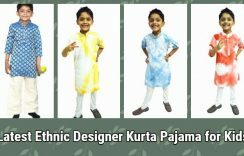 You can have these rich and lavish Indo Western designer kids wear and wedding clothes customized as per your preference so that they look impeccable on your daughter. Have them customized with complete ease for an uncompromised purchase and look and make your darling look the prettiest. Our Custom & Made to Order children dresses are created over a 1-3 week time frame. We offer FREE Shipping & COD options across India to make your shopping more rewarding. We now ship to over 225 countries worldwide Shipping at Low Prices like US, UK, Australia & Canada and across the world.